First Listen: Krzysztof Penderecki And Jonny Greenwood Hear the music Radiohead's Jonny Greenwood wrote in response to one of his own favorite composers, the 79-year-old Polish composer Krzysztof Penderecki — both full of noise, chaos and energy. 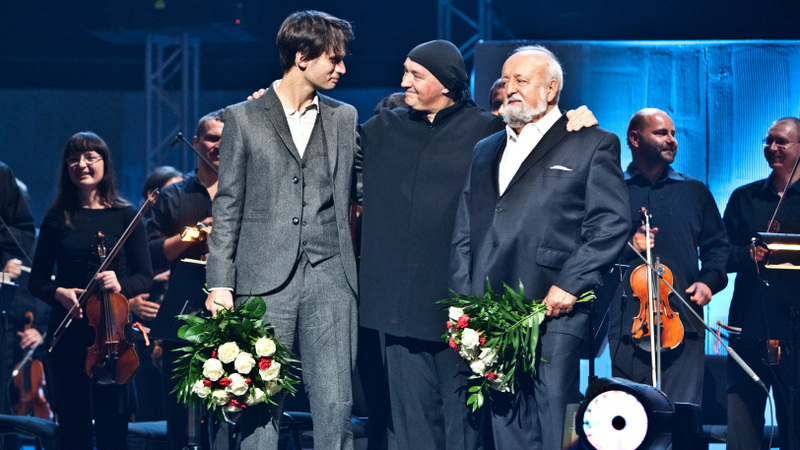 Jonny Greenwood, AUKSO Chamber Orchestra conductor Marek Mos and Krzysztof Penderecki, on stage after a 2011 concert. That challenge lies at the very heart of this album, which brings together one of rock and electronic music's superheroes, Radiohead's Jonny Greenwood, with one of his own idols: the septuagenarian Polish composer Krzysztof Penderecki. The collection features two string pieces written by the elder composer, 1960's Threnody for the Victims of Hiroshima and 1961's Polymorphia for 48 strings, juxtaposed with two of Greenwood's similarly set answers to Penderecki's work: Popcorn Superhet Receiver (inspired by Threnody) and 48 Responses to Polymorphia. Here, they both choose to use a seemingly antiquated vehicle — orchestral strings — to convey the noise, chaos and energy of our time. The results are ear-tingling. Penderecki is an idol to Greenwood: In a recent charming joint interview with the London Guardian, Greenwood describes the unlikely duo's first meeting: "I shook his hand after a concert like a sad fan-boy." But there's no fan-boyism here: What we hear on this album is a meeting of two artistic visionaries connected in a real dialogue, the decades separating their work and their chronological ages all but collapsed and deflated. Recorded in Kraków after a joint performance of their music last September, the performances are by Poland's AUKSO Ensemble with the composers' direct oversight; Penderecki conducted his own scores, while violinist, chamber musician and conductor Marek Moś led the group for Greenwood's pieces. Penderecki's Threnody originally carried a thoroughly abstract and deliberately unevocative title: 8'37" (a nod to composer John Cage's infamous 4'33"); it was only after the piece premiered that Penderecki linked his work explicitly to the horror of the atom bomb, though the piece's howls of anguish, expressed in all kinds of screams, rumbles and wails, speak clearly enough. The title change struck some observers as an opportunistic move, but the piece's popularity — and Penderecki's renown — skyrocketed after the name switch. Written in 2005 with 34 individual string parts, and written as a response to Threnody, Greenwood's Popcorn Superhet Receiver takes its name and inspiration from shortwave radio: It's the sharply articulated chaos of 34 individuals often going on their own trajectories, not the tightly controlled, gleaming unified mass that one might traditionally associate with classical players. Penderecki's Polymorphia also had a fascinating birth. The composer played a recording of Threnody for patients with mental illnesses at the Krakow Medical Center while the patients had encephalographs (brain-wave charts) made; he then based Polymorphia's musical lines around the shapes on their charts. In his reply to Polymorphia, Greenwood takes up that big, glorious and triumphant C Major chord — and then shatters that harmonic glow into smithereens. He begins with a strangely Bach-reminiscent chorale ("Es Ist Genug," or "It Is Enough," which is also the name of a famous Bach chorale) that Greenwood then distorts and dissolves over and over again. He builds tension and lets it drain away, takes up an idea and then lets it go in swirling eddies of motion.